March being Women’s History Month, during the next few weeks I’ll highlight Philadelphia women in dance. History tends to ignore the influence of dance on popular culture and, in doing so, often keeps hidden the inspiring stories of daring, creative women. The person who did the most to publicize ballet and create new audiences in the early 20th century was without a doubt Anna Pavlova. It was for the frail-looking Pavlova that Michel Fokine created the solo The Dying Swan, the role with which she would become most closely associated. In an era before air travel, it was estimated that Pavlova logged over 400,000 miles while touring the globe. She first appeared in Philadelphia with the Russian Imperial Ballet at the Metropolitan Opera House at Broad and Poplar Streets in 1910 to a house nearly filled by a curious public. The Philadelphia Inquirer wrote that “this form of entertainment possesses pleasurable possibilities which had not before been adequately realized in this vicinity . 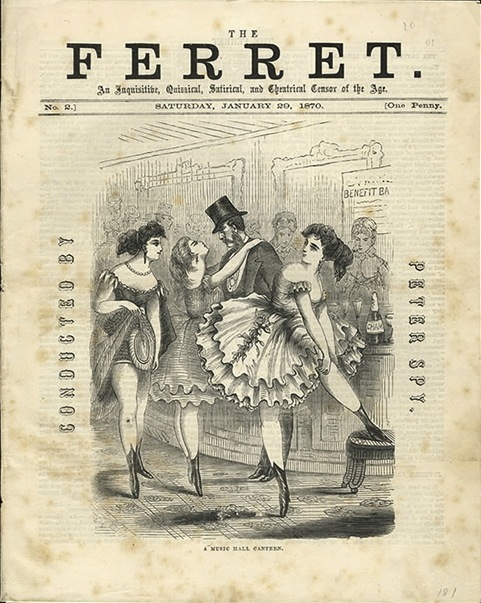 . . it did prove once more that the dance is entitled to be admitted to the company of the fine arts.” Indeed, Pavlova was to return to Philadelphia many times in the teens. Her face appeared on Wanamaker Department Store ads and, over eighteen weeks in 1915, The Evening Public Ledger published a series of illustrated articles in which “Pavlowa, peerless dancer” would instruct Ledger readers in her versions of the waltz, the onestep and the polka. The incomparable Pavlova had shrewdly used the mania for ragtime ballroom dancing to promote her company and classical ballet, widening her audiences and her appeal. Appealing to a wide audience was just what Littlefield did. The Company performed where they could find an engagement – in high schools, women’s clubs and athletic associations. The company was fresh, young and full of enthusiasm. They performed pieces set to classical European music choreographed for them by Littlefield, such as Bolero to music by Ravel, Viennese Waltz to Strauss melodies and a full length Sleeping Beauty. However, they also performed American themed pieces like Barn Dance, which popularized American rural themes before Agnes DeMille’s Rodeo and Eugene Loring’s Billy the Kid (see photo, below); The Rising Sun, an historical piece marking the 150th anniversary of the Pennsylvania constitution and Cafe Society, a spoof of the nightclub scene. 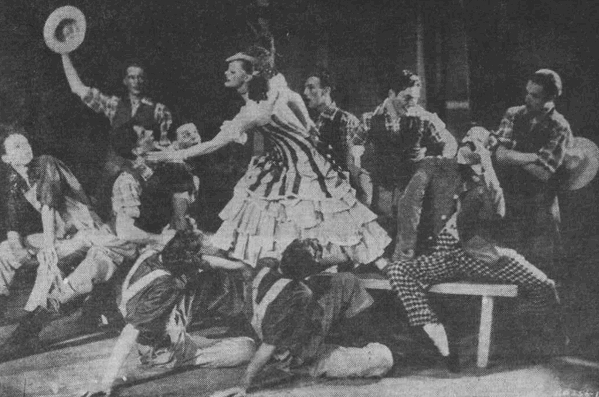 The company performed to acclaim in New York, and later with the Chicago City Opera. In 1937, Littlefield’s Philadelphia Ballet became the first American company to tour Europe. 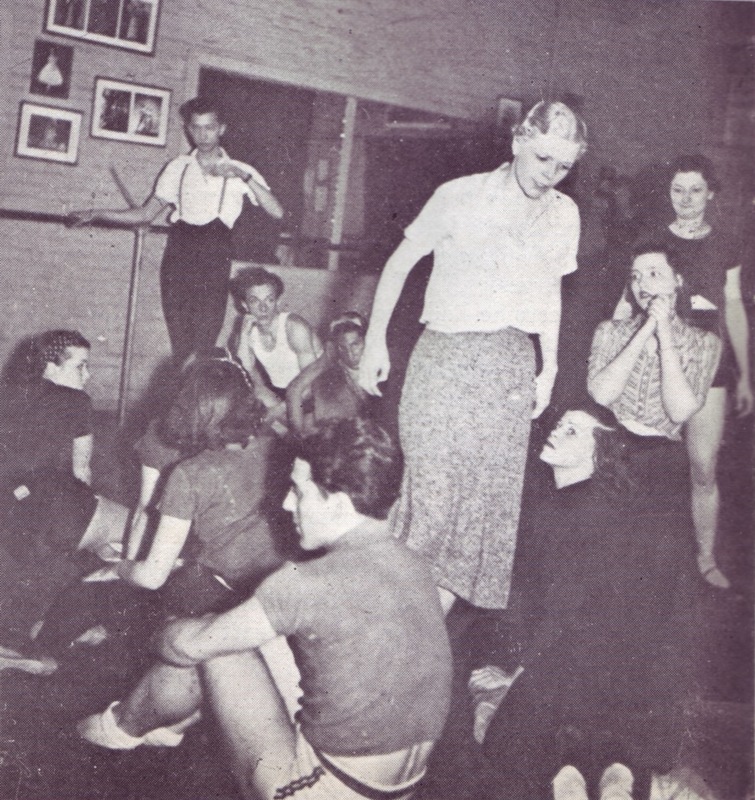 In the early 1940s Littlefield lost too many men to the war draft to maintain a performing company – she had always stressed the importance of strong, athletic male dancers. She spent the rest of the decade choreographing ice shows and making significant contributions to musical theatre. Littlefield crackled with energy yet was calmy focused; a contemporary commented, “She was dry ice–fiery and cool.” Cancer ended her life in 1951. 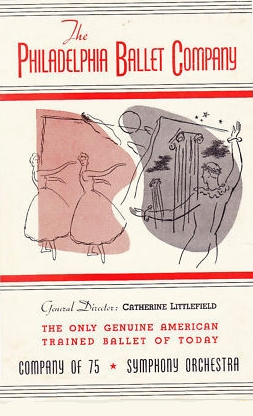 The short career of Philadelphia dancer, teacher, choreographer and director Catherine Littlefield, as well as the fact that she was a woman artistic director in what had been a man’s game, only make her accomplishments more extraordinary. Like Pavlova, she widened the audience for dance with her commitment, high technical standards and personal vision. An amazing woman, Littlefield’s story is a significant, if forgotten, chapter in the history of 20th century American dance. I’m totally captivated by Pavlova’s exquisite outfit! If only Bjork had worn this to the Academy Awards in 2001…although that outfit truly was a flight of fancy.